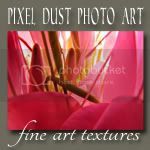 Pixel Dust Photo Art: Apologies! Link-up now for Photo Art Friday!!! Apologies to those of you who have tried to link up. I have not been able to connect to the internet for most of the last 36 hours due to problems with our server. The inlinkz tool is now up and I hope you will try to post your photo art again. So sorry for this inconvenience. 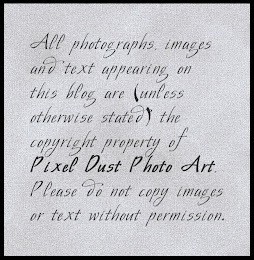 If you are new to Photo Art Friday, you can read the simple guidelines for participation on the Photo Art Friday page. 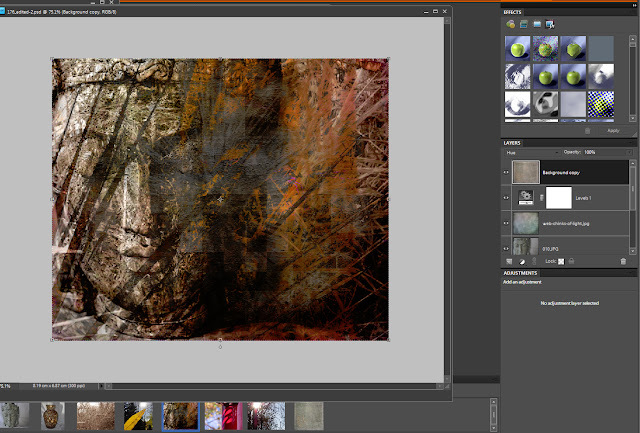 Photographs and texture processed in Hue blend mode at 100% Opacity. Photographs and texture processed in Saturation blend mode at 100% Opacity. Photographs and texture processed in Color blend mode at 100% Opacity. 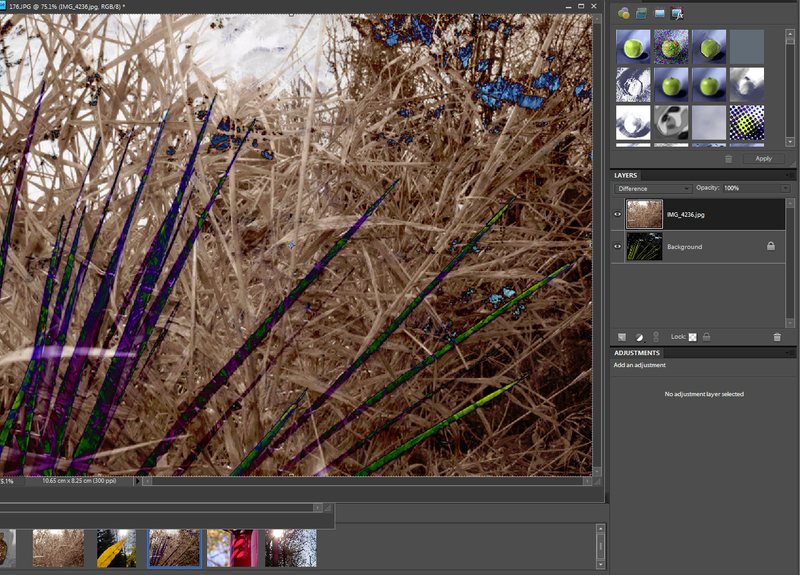 In the Layers Panel you can see that I have applied one photo of spikey grass on top of another of a cluster of dried grasses. 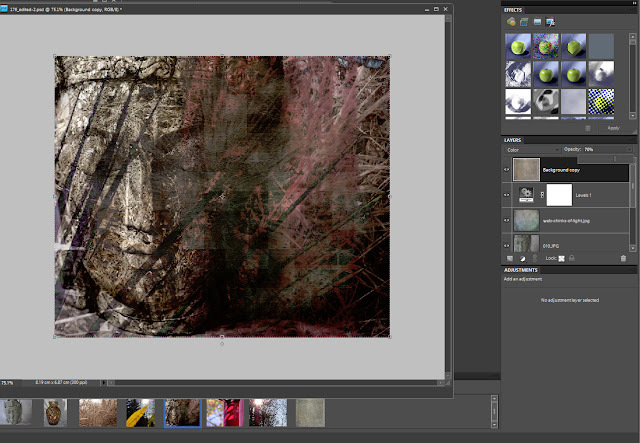 The Layers Panel on the right of the screenshot, shows the addition of two more photographs. (A red metal bar with ovals of light, and a photograph of the face of some sort of goddess/buddha statue in my garden. The texture has yet to be applied. 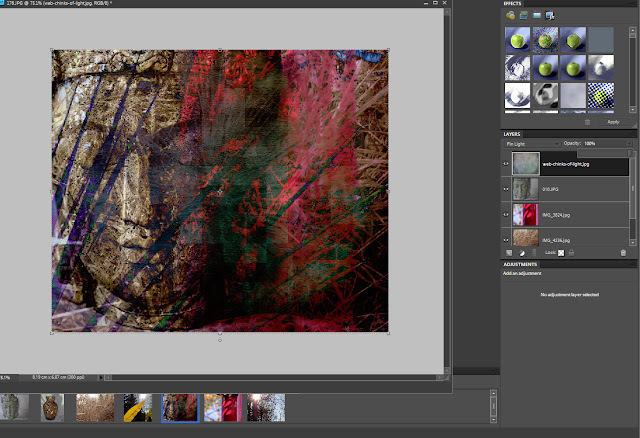 Now, at the top of the layers panel you can see that I have added the texture "Chinks of Light". 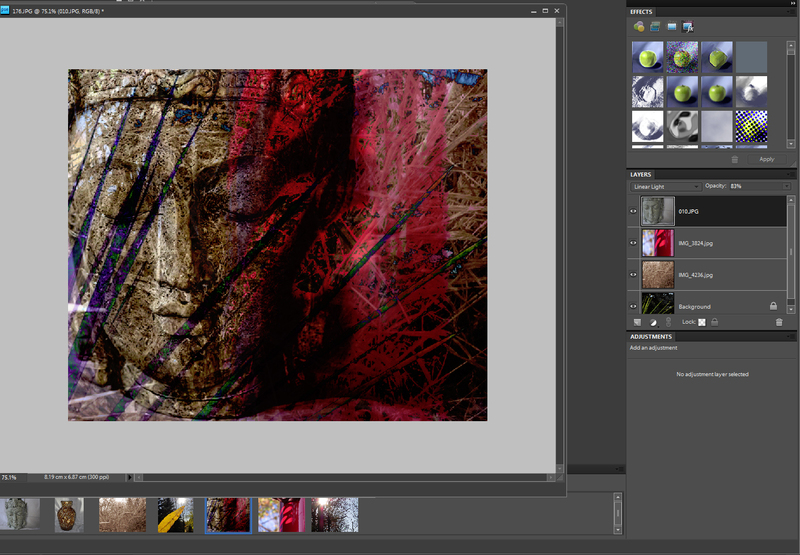 Pin Light is the blend mode at 100% Opacity. You don't really see the texture but it will bring an added dimension, if subtle, into the mix. Pin Light is not really producing an effect I like. Here I try Hue blend mode at 100% Opacity and like the effect. 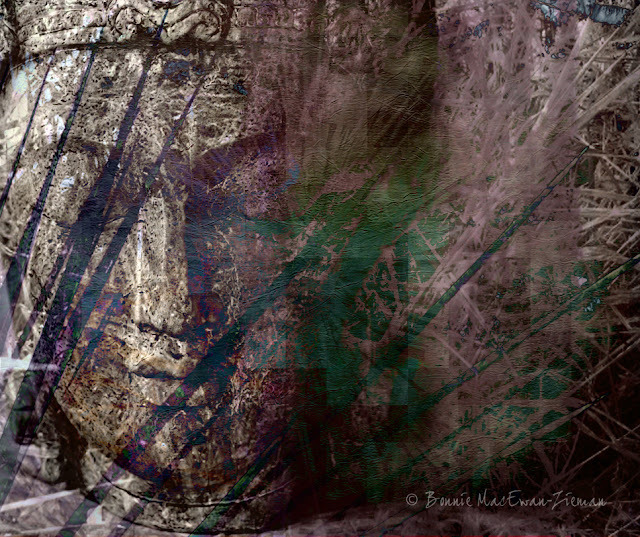 As you can see, making this sort of abstract art does not require any skill at using Photoshop!! 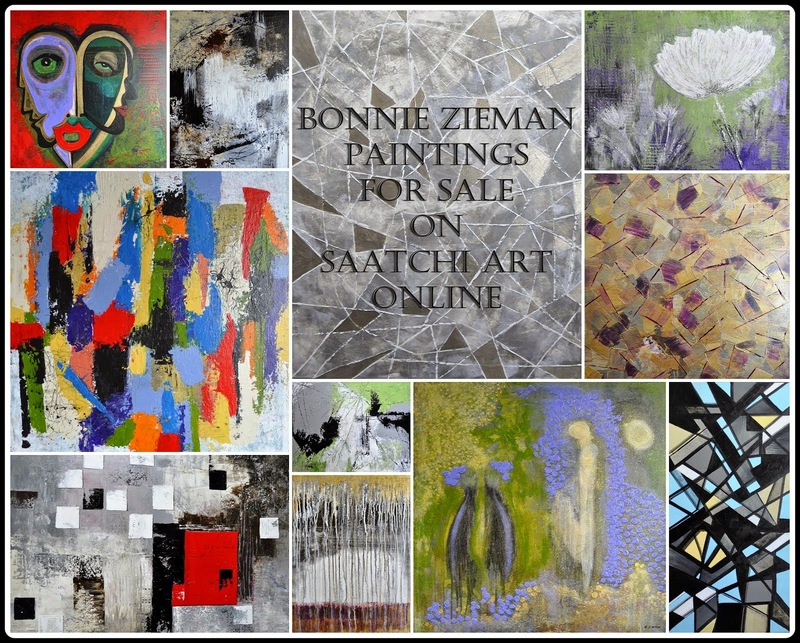 It is more the choice and placement of images and textures that create the abstraction. The only Photoshop edits used here were the blending modes at full opacity. Really cannot get any easier than that!!! There's no limit to where you could take your creations after that. 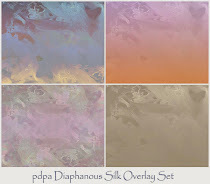 Those of you with more expertise in Photoshop are certainly imagining many more digital manipulations you can use to create a piece of abstract art. Perhaps you will share your secrets!?!! 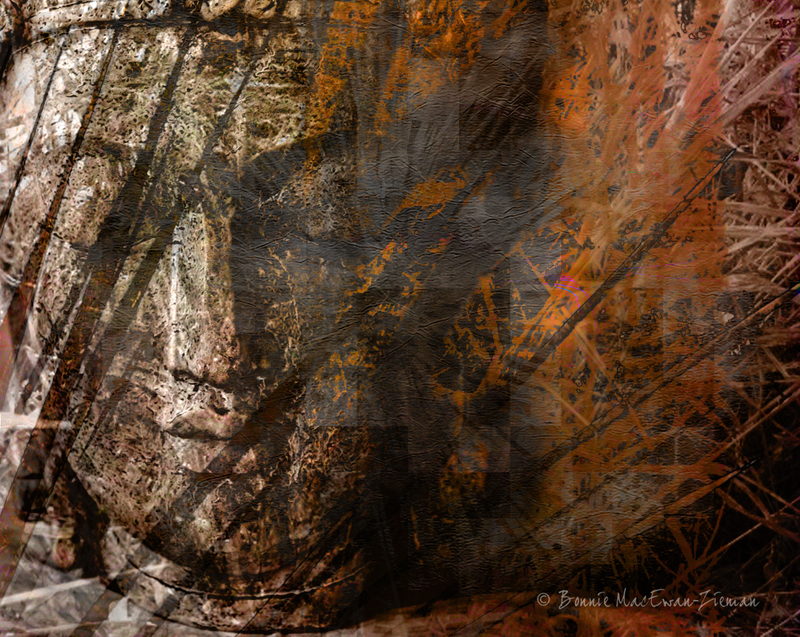 For next week's Photo Art Friday, the challenge to you is to use three (3) of your photographs (or cropped parts thereof) and at least one (1) of my textures to create a piece of abstract art. (Please add a little explanation of your process in your post.) If you begin experimenting now, I'm sure you will have something great to share by next Friday! Wow, these are gorgeous. My favorite is the top one, the colors are so warm. I liked reading about the process and I definitely have to try it. It doesn't sound very difficult. Thank you, Bonnie. Hi Bonnie! Love your example of abstract.... is just perfect, and what a great teacher you are on this. Have also been waiting for your link to come up..... running late? Bonnie, you little demonstration are a great help in creating images using your textures, I can never find the link for posting images to the challenge. Does it not come up until Friday? Love what you did with these. I don't see a link to link up for PAF. I'll check back. Maybe tomorrow. Bonnie....where do we link up for Photo Art Friday? Can't seem to find the link up button. I read the instructions on the other blog page for Photo Friday, but I'm still not sure I did it correctly. I tried using several 'threes'...but I don't use photoshop either, I use paintshop pro. Anyway, my first attempt [and maybe my last, lol] is up for viewing. PS - I also remembered to record my "recipes" for a change!! Finally able to reconnect to the internet after a couple of days of isolation (and withdrawal! ), I have found all your messages wondering where the inlinkz hook up is ... It's back where it should be and I will be so grateful if you make time in your busy schedules to come back and try again. Sorry for the confusion and inconvenience. Our entire street was having internet connection problems after a night of strong winds. Thank you for your patience and hopefully your persistence. It's all understandable. Things happen. Your effects are beautiful, as always! Glad you got the link up and things are running smoothly again. Great use of your texture and added elements here. I like the way you used the grasses to highlight the statue. It really does have an Abstract feel. My favorite is the "Orange" version. Your photos and all those submitted ... really amazing! But think I can use it for next friday!